For the most part, monohull yachts do not have as friendly a set of accommodation as power boats of the same size. Entering is generally down a long and steep ladder, and you are then isolated from the outside world. Half or more of the sleeping arrangements are more or less cramped quarter berths tucked either side of the cockpit. If you are talking about a small vessel and want the ability to sleep a few friends, that is pretty much how it has to be. 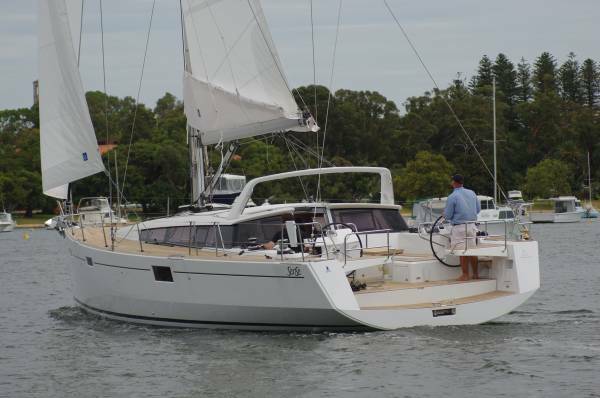 But with larger vessels there are other possibilities, and Beneteau, with their Sense 50, have certainly explored them. Just three shallow steps take you down to a wide, spacious compartment lit by large windows in the hull as well as the coachroof - strongly reminiscent of a power craft or a sailing catamaran. 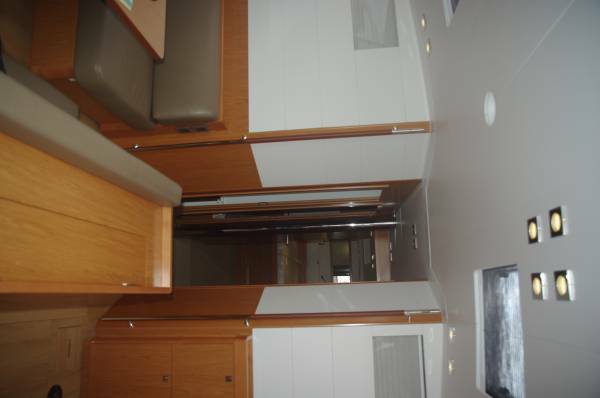 The space aft of the saloon’s rear bulkhead is given up to storage and machinery instead of bunks; there is a theoretical crew cabin back there as well, but practically it is just more storage. There is plenty of machinery to accommodate. A 75hp Yanmar that is good for 12 knots, a genset, a 60L/hr desalinator supplementing the 1230L fresh water tanks, air conditioning plant, two battery chargers and a set of inverters. Because the machinery space does not intrude on the accommodation, it is remarkably quiet below. 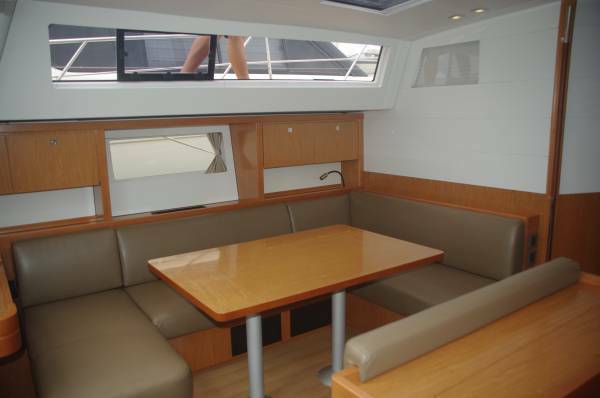 The saloon has a vast leather upholstered dinette that can seat people all round, or on three sides with small adjustments that allow viewing of the pop-up TV, and the table can lower to make a queen size bed. The dedicated navigation area is the biggest I have seen on a yacht, and so is the galley, equipped with microwave, three burner gas stove and both top and front loading fridge and freezer. Without question, this is a top entertainment area and with easy access to another in the vast cockpit. The three cabin layout is much what you would find in a 50ft power boat: two double cabins, the owner’s with an ensuite, the other sharing a bathroom with the twin cabin, and plenty of hanging and storage space. There is also abundant headroom. The cockpit is a delight. 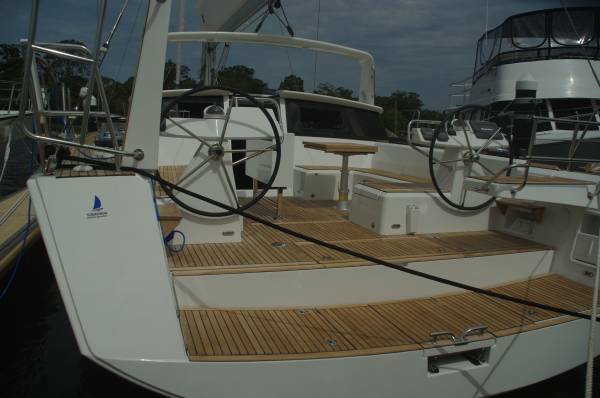 It is sheathed in timber like the rest of the upper decks, and very well laid out. The open transom is quickly closed by inserting a fashion board, lowering a pair of seats, and clipping on a guard wire. The area is vast and uncluttered, with the sailing mechanics living around the edges: the traveller is on a gantry over the companion way, lines from the mast foot run aft through tunnels, tails drop into lockers in the coamings. The twin wheels, each with an instrument console, are wide enough spaced to give easy access through the transom. 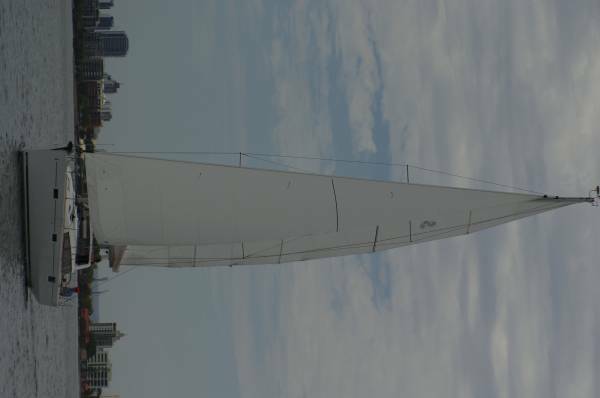 The masthead rig has the optional headsail that is self-tacking as well as furling, making this an easy two-hander. On the other hand there is nothing of the plodder here. 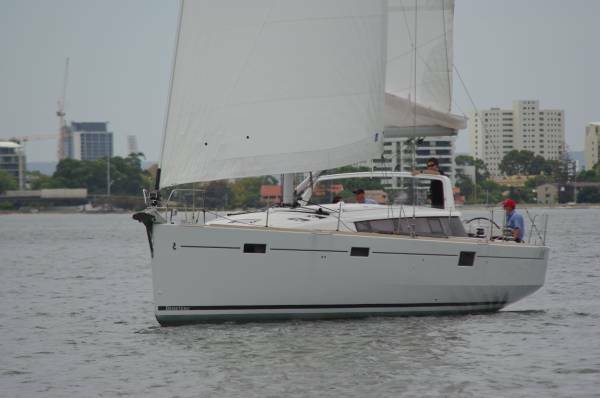 Beneteau has a cruiser range and a racing range, and the new Sense range sits in between. All the good bits are on board: excellent hardware, solid vang, inner forestay for offshore work, and a high performance keel. This boat can sail. For cruising mode, it also has great ability under power. The 3-blade folding propeller is mounted on a fully swivelling saildrive, part of the Dock and Go Yanmar system. Electronically linked to the bow thruster, and controlled by joystick, the system lets you drive the boat forwards, backways and sideways or spin it on the spot. The 50 is full of surprises and has a huge inventory of goodies. I know no other yacht whose washboard is armour glass electrically raised and lowered. Similarly, the cockpit table has electrics to convert it to a daybed effortlessly. Having a safe might sound extravagant, but it makes sense if you have visitors not well known to you. The Automatic Identification System is magical, giving you the name, course and speed of ships you encounter – very useful if you need to contact the ship on VHF. All these refinements add to the 50’s price of course. 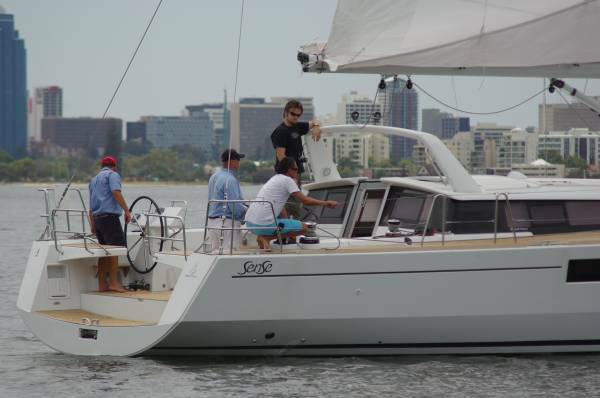 As reviewed the Sense 50 costs $735,000, but a more Spartan fit-out allows you into this highly competent boat for $472,800.